Growing up with cerebral palsy, I was the only physically challenged person in my family and community. Dancing Dreams made me see that there were lots of other kids like me…It was an important moment when I understood that physical and medical challenges are something that affect a large number of people. While some challenges may not be as visible as mine, it is all around us and it is something that is not unique to my experience. I am forever grateful to Dancing Dreams for providing me with these feelings of friendship, freedom, belonging, and confidence. 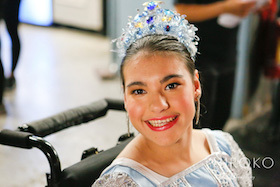 Not only did Dancing Dreams make me believe in myself and my abilities, but it encouraged others to see beyond my wheelchair and to recognize that I am a ballerina and a dancer. The dream of little girls to put on a tutu and glitter—and dance just like other little girls their age. Despite their dreams, these girls were not able to dance like their friends, sisters, cousins and even their mothers. They had physical and medical challenges that prevented them from joining classes in their community. Joann Ferrara, a pediatric physical therapist, was inspired to make the dancing dreams of children come true when one day a little girl with cerebral palsy in a tiara and tutu said simply, “I wish I could be a dancer but nobody wants me.”Dancing Dreams has grown from five girls to approximately 200 teens enrolled in our Leadership Program. Classes are adapted so each child can participate to the best of his or her own unique ability. Our annual performance, complete with elaborate sets and numerous costume changes, is a highlight for our dancers and their families. We do not charge admission to this celebration of achievement. Weekly classes are held in three locations: Bayside (Queens), Upper East Side (Manhattan), and Plainview (Long Island). Dancing Dreams is a 501 ( c) 3 nonprofit. We rely on charitable contributions to sustain our program. What do they do in the class? They dance! Each aspiring dancer has a Helper to assist the dancer during classes and performances. Approximately 200 teens are currently enrolled in our Leadership Program. Each year culminates in our Annual Performance- our celebration of achievement. Who can enroll and where are classes? Any child who is physically or medically challenged with a dream to dance! 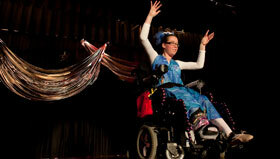 Dancing Dreams is based on abilities—not disabilities. This allows each dancer to advance within his or her own limits and maximize their own potential. Dancers come from all over the tristate region to participate in weekly classes at our Bayside (Queens), Upper East Side (Manhattan), and Plainview (Long Island) locations. There is a voluntary contribution for classes to help cover the cost of the program. However, no child is ever turned away for an inability to pay. There is never a charge to join us at our annual performance.